Practical problem solving begins with Grasping the Situation (GTS). The European Union is one our biggest international problems. EU failure would cause much disruption & pain around the world. Is the EU viable? If so, what governance changes are needed? How can the prosperous north help the struggling southern countries, unflatteringly known as PIGS - (Portugal - Ireland - Greece - Spain)? 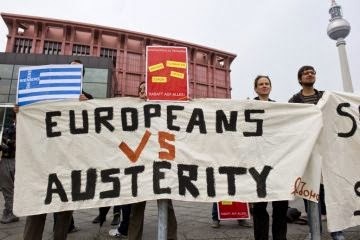 EU bureaucrats appear have jumped to a countermeasure -- AUSTERITY! Have they grasped the situation? Michael Jacobides' terrific HBR piece suggests NOT. Interestingly, Jacobides' grasp of the situation mirrors a conversation I had in Greece, and shared in Reflections of a Business Nomad. If we accept Jacobides' argument, the countermeasures are clear, but difficult. As he explains in a follow-up piece, "Dinosaurs die hard"